Just like humans, the nutritional needs of canines’ changes as they grow older. Senior dogs are more prone to health complications and can suffer from a variety of conditions. While it’s important to provide your four-legged family member with the best care possible throughout all stages of life, the care that you provide him with as a pup will differ as he reaches his golden years. As dogs age, they become less active, their immune systems weaken, their cognitive function can slow, and their joints can deteriorate. These are just some of the health issues that mature canines’ experience. While taking your pooch to the vet for regular well-visits is crucial for his overall health and well being, feeding him a well-balanced dog food that is formulated to meet his unique nutritional needs is just as important. What type of food should you feed a senior dog? At first glance, the answer to that question might not seem difficult; but in reality, selecting the right food for your mature furry friend can be a lot harder than it appears. There are so many different dog food brands and formulas on the market, from grain free dog food to low protein dog food, and from dog food for allergies to dog food for sensitive stomachs. With so many options to choose from, figuring out which food will offer your four-legged family member the nutrition that he needs during his senior years can be very daunting. To help you find the best possible food for senior dogs, we’ve compiled a list of what we think are the best dog food for older dogs. Now that you have had a look at our top five choices for the best dog food for senior dogs, let’s take a closer look at each one. Below, we offer a detailed review of each of these formulas, including the ingredients they contain, why we think they are the best option for older pups, and what other pet owners who feed their senior pups these formulas have to say about them. Once you’ve read through each of the reviews, click on the buttons to find the best prices currently available on Chewy and Amazon. 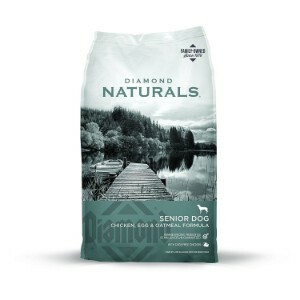 The first product on our list for the best food for older dogs comes from Diamond Naturals. Many pet owners rely on Diamond Naturals dog food to provide their pooches with the nutrition that they require at any stage of life. Their Real Meat Recipe Premium Specialty Senior Dry Dog Food is specifically made for canines that are 8 years of age or older. Instead of featuring protein as the first ingredient like many other dog formulas, whole grain brown rice is the first ingredient in this recipe. Since brown rice is easier to digest than protein, it’s better for sensitive tummies, an issue that many senior dogs suffer from. Protein is the second ingredient, so it still offers a healthy dose of this vital nutrient. In this formula, the protein is sourced from premium cuts of deboned chicken. Other ingredients include healthy (and tasty) fruits and vegetables, like peas, oatmeal, kale, blueberries, oranges, quinoa, kelp, coconut, spinach, carrots, papaya, and chia seed. All of these ingredients contain a wealth of essential vitamins and minerals and are regarded as “superfoods”, so you can rest assured that your pet will be getting the nutrition that he needs. The addition of antioxidants helps to reduce the effects of oxidative stress, an issue that can plague older dogs and cause a number of serious health issues. This recipe is also formulated with glucosamine and chondroitin, two ingredients that are proven to improve joint health, which is very important for senior dogs. Final Verdict: Diamond Naturals Real Meat Recipe Premium Specialty Senior Dry Dog Food is specially formulated for older pups. It features a unique blend of fruits and vegetables and is formulated with essential nutrients to deliver optimal health for aging dogs. Purina dog food is also among the most reputable brands on the market, with countless pet owners around the globe relying on their various formulas to deliver optimal nutrition for pets of all ages and sizes, including Bull Mastiffs, German Shepherds, Pugs, Westies, Collies, and every other breed you can think of. 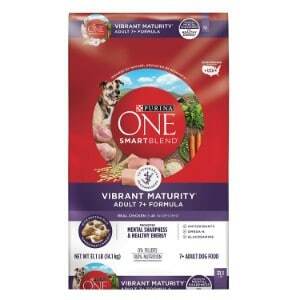 Purina One Smart Blend Vibrant Maturity is a dry dog food that is specifically made for adult pooches that are 7 years of age and older. The first ingredient in this Purina recipe is premium cuts of chicken, which will provide your pup with the protein that he needs to build and maintain healthy bones, muscles, and joints. It also contains glucosamine that has been procured from natural sources to further strengthen those joints. The addition of botanical oils that are proven to enhance cognitive function will keep your furry pal mentally alert. The blend features a combination of tender morsels and crunchy kibble that will satisfy your canine companion and keep him well nourished throughout his older years. However, do note that this recipe does contain soy, corn, and wheat, so if your pup is sensitive to these types of ingredients, you might want to consider another option on our list. Based on the reviews, however, pet parents who use this recipe say that their dogs love the taste and notice improved energy levels. Final Verdict: Purina One Smart Blend Vibrant Maturity Adult 7+ Formula Dry Dog Food offers the nutrients that older dogs need to thrive. It’s fortified with glucosamine for joint health and botanical oils that improve mental clarity. The majority of customers who use this product report positive results. 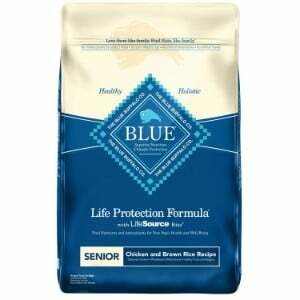 If you are looking for a grain free dog food that is made with all natural ingredients, then Blue Buffalo Life Protection Formula Natural Senior Dry Dog Food is definitely an option that is worth considering. Just like all other Blue Buffalo dog food products, this formula is made with real protein that is sourced from the highest quality animals; in this recipe, the protein is sourced from deboned chicken and chicken meal. Combined with glucosamine and chondroitin, these ingredients are proven to foster stronger joints by supplying pups with the vital nutrients that are needed to strengthen their muscles. So, if you have a senior dog that is prone to hip dysplasia, such as a Great Dane, a Saint Bernard, or a Dachshund, or if he has already been diagnosed with this condition, this dog food might be able to help improve his mobility and ease his pain. It’s also made with natural carbohydrates, such as brown rice, barley, oatmeal, peas, and flaxseed, so it’s easier to digest. There are absolutely no grains, like corn, wheat, or soy, so if your pet is sensitive to these ingredients, you’ll have peace of mind knowing that he won’t be aggravated by eating this food. Other premium ingredients include sweet potatoes, carrots, potatoes, blueberries, cranberries, tomatoes, turmeric, kelp, and a bevy of vitamins and minerals to offer your aging dog a well-rounded meal that will improve his overall health. Dog owners say that their pets’ love the taste and that they are very pleased with the results. Final Verdict: Blue Buffalo Life Protection Formula Natural Senior Dry Dog Food is specifically formulated to offer your pet the well-balanced nutrition that he needs to support his health as he ages. Featuring the best natural ingredients and free of additives, preservatives, and artificial colors, you can have confidence knowing you will be feeding your pet a safe and healthy dog food. 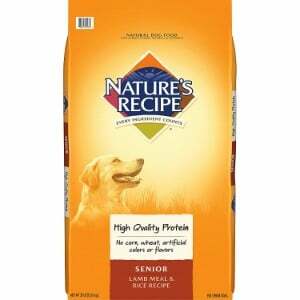 Next up on our list of the best food for senior dogs is a Nature’s Recipe dog food. This is another manufacturer of pet food that is highly regarded for creating recipes that contain the highest quality ingredients to support optimal nutrition, and this formula is made to specifically improve the health of older dogs. Featuring healthy, lean sources of carbohydrates, like brown rice, oatmeal, and barley, this food is easy to digest and will help to maintain the energy levels of your aging furry pal. It also has fewer calories than many other dog food formulas, so it can be considered a dog food for weight loss. Feeding dogs of any age, but particularly older dogs, too many calories, can lead to weight gain, which can wreck havoc on their joints and tendons. As long as you feed your pup as directed and provide him with plenty of exercise (fit your pup with a comfortable dog harness and take regular walks), he should stay fit and trim. Formulated with a wealth of essential vitamins and minerals, such as vitamin C, vitamin A, B vitamins, zinc, iron, calcium, and so many more, your older four-legged family member will be able to retain his health when you feed him this well-balanced, highly nutritious food. Final Verdict: If you are looking to feed your senior dog a high quality food that you can be sure will offer him the vital nutrition that he needs to thrive, Nature’s Recipe Senior Lamb Meal & Rice Recipe Dry Dog Food is a great choice. It’s made with wholesome ingredients, features essential nutrients, and will keep him satisfied. If your senior dog is finicky or is having trouble eating dry kibble because of dental health issues, then feeding him a wet dog food that is specifically formulated to meet his needs is a great option to consider. Wet food is softer than dry kibble, so it is easier for older dogs – particularly those that suffer from dental issues – to chew. It also has a more robust flavor that mimics the taste of the food that dogs would have eaten in the wild, which means that your senior pooch might find it more palatable. Made with the most wholesome ingredients, like real animal proteins and easy to digest carbohydrates, this formula will keep your pet satisfied and health. It’s also fortified with glucosamine and chondroitin to improve his joint health and help stave or ease the pain and reduced mobility that is associated with hip and elbow dysplasia. Other prime ingredients that are featured in this wet dog food formula for senior dogs include tomatoes, spinach, carrots, brown rice, peas, oatmeal, and a variety of essential vitamins and minerals to ensure optimal health for your aging pooch. 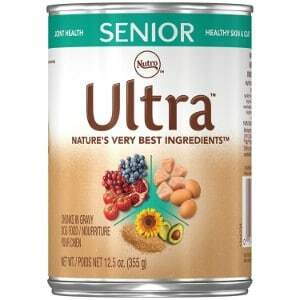 Final Verdict: NUTRA ULTRA Senior Wet Dog Food is made with the highest quality ingredients to deliver balanced nutrition for senior dogs. The morsels are tender and easy to chew, and the recipe delivers a very palatable flavor that your pooch will love. When it comes to caring for your dog, the food you offer him is one of the most important decisions that you can make. Like humans, the food canines eat has a direct impact on their overall health and well-being. Also like people, dogs’ nutritional needs change as they grow older, which means that it’s important to ensure you are offering him a diet that is specifically formulated for older dogs. But there are so many different dog foods on the market, which can make it hard to decide which option you should feed your senior dog. In the buyer’s guide section of our review, we offer important information that can help you make the best choices for your aging furry friend. Senior dogs, like senior people, can develop a number of health issues. These issues can include arthritis, hip and elbow dysplasia, gum disease, diabetes, cognitive decline, kidney disease, and liver disease; and these are just some of the issues that they can develop. The best way to help prevent these conditions – or ease them if they have already developed – is to offer your senior pup a well-balanced diet that is specifically formulated to meet their nutritional needs. With that said, senior dog foods are different from dog food for puppies or adult dogs, contain specialized nutrients that are intended to improve the health of mature adult dogs. Premium ingredients. Just like dog food for canines of any age, the best dog food for senior pups should be made of premium quality ingredients. That includes real sources of animal protein (read the label to make sure that the type of animal that the protein is sourced from is listed), real fruits, and real vegetables. Added nutrients. As mentioned, mature dogs require a perfect blend of certain nutrients to ensure that they are as healthy as possible. Make sure that the food you are choosing contains a variety of vitamins and minerals, such as B vitamins, vitamin D, vitamin E, vitamin A, iron, magnesium, and copper. You should also consider looking for a recipe that is formulated with glucosamine and chondroitin, which help to support the development of lean muscle mass and maintain joint health to reduce issues like hip and elbow dysplasia , which can cause significant pain and reduce mobility. Free of artificial ingredients. A premium quality senior dog food should not contain any artificial ingredients, like preservatives, flavors, or colors. These ingredients can cause adverse reactions in canines and can contribute to a number of health conditions. So, how did we decide which senior dog food options are the best? We enlisted the help of veterinarians and animal nutritionists, who helped us assess the ingredients in various types of dog foods that are formulated for senior dogs. We also read through countless reviews from pet owners. Based on the information that our panel of experts offered and the information that we acquired from the reviews we read, we were able to narrow down the wide selection of options to the five formulas that are featured in our review. Each of these five formulas are made with the highest quality ingredients, are fortified with essential vitamins and minerals, and have been found to offer outstanding results to improve the health and well being of senior dogs. As your furry pal ages, it’s important to make sure that you are offering him a well-balanced diet that meets his unique nutritional needs. All of the pet foods that are listed on our review are premium quality ingredients and receive the stamp of approval from our panel of experts. If, however, you are going to opt for another formula, make sure that you carefully read the labels to make sure that it is made of the best ingredients to support your pet’s needs.